Charon is an interactive installation and sculpture intended to physically embody the tension between humans, robotic autonomous agents, and the virtual models which these agents rely on to understand the world. A quadcopter was programed to fly autonomously in a motion capture lab while aggressively, defensively, and playfully tracking a human body within the space. The video documentation of this interaction has a performative, dance-like quality, but is unrehearsed and spontaneous because of the unpredictable nature of the drone’s behavior. Interacting with the drone gave me a sense of cautious curiosity as our behavior ebbed and flowed between combat and cooperation. 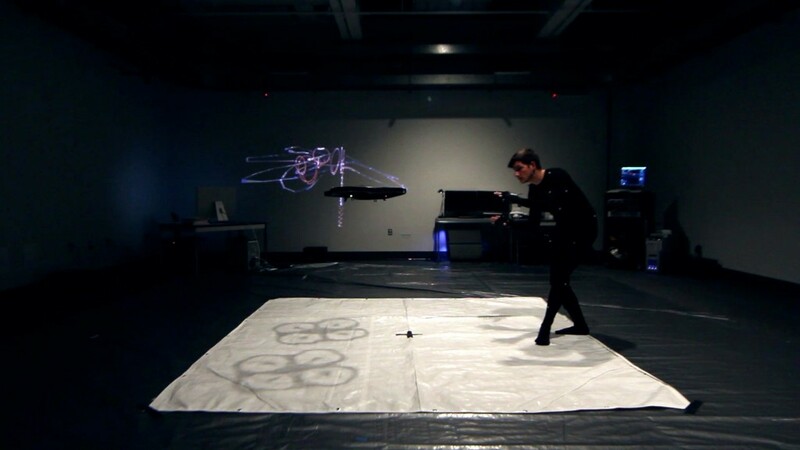 A motion capture system and computer simulation recorded the drone’s flight path and rendered it as a 3D form based on the drone’s velocity and orientation during flight. As I evaded and lured the drone through the lab its virtual representation collided with the previous flight path which then sculpted the form in the direction of the flight. This feedback loop gave the sculpture a kind of memory and responsiveness which allowed for the complexity of our interaction to be faithfully embodied. These physical and virtual forces created a two-way boundary crossing between the internal world-model of the drone, and its external physical surroundings. The resulting sculpture can be considered as the shadow of this boundary crossing, fueled by the complex exchange between a sentient human and a robotic proto-lifeform. Sterling Crispin is an artist and technologist born 1985 in Maui, Hawaii. His work explores the relationships between spirituality, human consciousness, and impermanence as they relate to the exponential growth of computing technology and our networked global culture. He received his Master of Fine Arts and Master of Science from the University of California Santa Barbara. Crispin has lectured and given workshops at the LACMA Art + Technology Lab, UCLA Art + Science Center, NYU’s Interactive Telecommunications Program, the Drones & Aerial Robotics Conference, YouTube Space LA, and the Boulder Museum of Contemporary Art. His work has been published by Frieze Magazine Berlin, Artinfo.com, Rhizome.org, Wired, and Forbes.com. His work has been featured in over 30 exhibitions and events internationally including “Sneakerotics” at Edouard Malingue Gallery, “Beyond the Bond” at Studio Gallery, “#FUTUREMYTH” and “Dump.fm IRL” at 319 Scholes Gallery, and published in Katja Novitskova’s “Post Internet Survival Guide”.